'We Try It' is a regular series where we try the latest off-beat eats. Whether you have played it or not, most people are at least familiar with the game Angry Birds. You know, that game where you throw disgruntled birds at rudimentarily built fortresses that are defending evil green pigs? 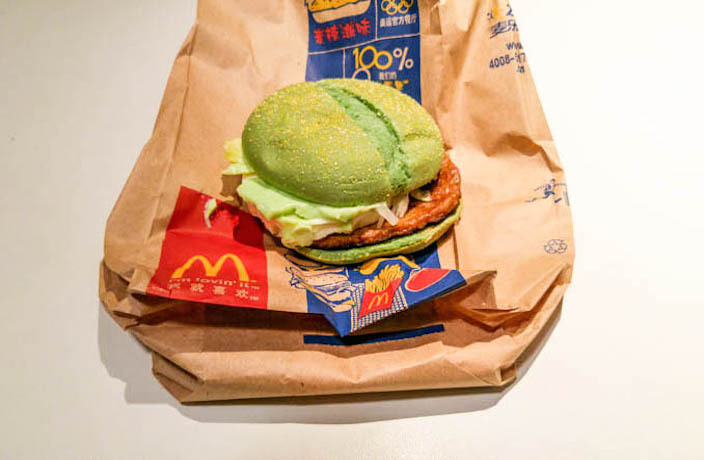 In honor of the impending release of the new Angry Birds film in China, McDonalds has released several new Angry Bird themed menu items, the most intriguing of which would have to be the Naughty Green Pork Burger. The burger itself wasn’t half bad. It wasn’t as large, or as succulent as the advertisement made it appear, but then again they never are. The burger included a pork patty, an egg, lettuce, a mysterious sauce with a hint of jalapenos, and the notorious green buns. Setting one back a mere RMB28 (that’s for the burger alone), it is quite satisfying, and we are "lovin' it." For more 'We Try It,' click here. Keep your red wine fresh for as long as possible with this must-have gadget. Start your day off right with these flavorsome coffee products. Stock up your fridge with these refreshing imported beers! That's columnist Chris Foste is a bearded beer fanatic whose frothy pint glass of knowledge flows over with wisdom on the wetting of one's whistle. Cool down with a nice cold drink. Want to enjoy a refreshing soda at home? Now you can!